A Reserve officer was seriously wounded by shrapnel from a Hamas rocket in the Eshkol region in the Western Negev Tuesday. 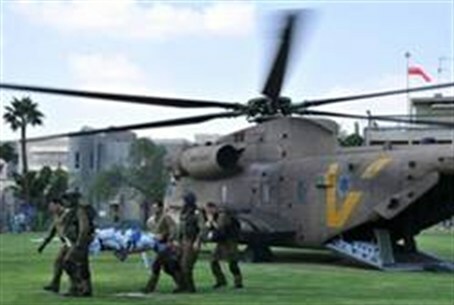 A Reserve officer was seriously wounded by shrapnel from a Hamas rocket in the Eshkol region in the Western Negev Tuesday morning and was flown by helicopter to Tel Hashomer Hospital in Tel Aviv. First aid at the base where he was stationed was credited with saving his life. “We have witnessed this morning an escalation by Hamas, a change from recent days when Islamic Jihad was behind the missile firings," the IDF Spokesman, Brig. Gen. Yoav Mordechai said Tuesday. After a relatively quiet night, when silence was interrupted by approximately half a dozen rockets, Hamas revved up the offensive Tuesday morning, firing more than 120 rockets and missiles. More than 20 missiles threatened Be’er Sheva, where a private home was severely damaged by a direct hit. Another missile exploded next to a bus, lightly injuring the driver. the driver prevented a probable catastrophe by quickly stopping his bus, opening the doors and urging passengers to flee and take cover after he heard a warning siren. Thirty seconds later, the missile exploded, virtually destroying the bus. The Iron Dome intercepted more than a dozen other missiles aimed at Be’er Sheva. The massive barrage has forced the IDF to close the Kerem Shalom crossing, where 120 trucks are waiting to bring food, goods and merchandise into Gaza. Israel has put a ground incursion on hold in anticipation of an urgent visit by U.S. Secretary of State Hillary Clinton as pressure grows for a ceasefire. United Nations Secretary General Ban Ki-moon already is in the country and is to meet on Tuesday with Prime Minister Binyamin Netanyahu.